are really looking for someone else to make a decision for them that would effectively change them. They seem to hope that their life will change without having to make a decision or take action. 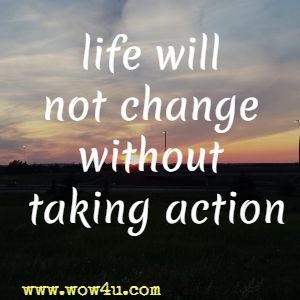 I have met more than one person who desired a change and hoped for a better life but were more than willing to let another decide the best for them. In some cases, the person would change only if another life promised more than they had right now even though that lifestyle saw them confined to jail more often than they were free. Such was the case of a young man I met while working within the correctional system. In this particular case, this young man had become used to living the high life with all the material things he wanted but these were all acquired through criminal activity. The only flaw with his lifestyle was that he would invariably be caught and given jail time again and again. It wasn't that he had committed heinous crimes but crimes that were subject to frequent arrests. One day, he called me over to his cell and began to ask me how he could change his life so that he wouldn't end up in jail again. I asked him if he was really serious or if he was only putting in time by using my time? He said he was serious. I went through a number of options with him trying to find out what his educational background was, what he was interested in, and if he had support mechanisms in the community that would help him while he attended classes. I was directing him to some possible careers so he could think about what he really wanted and would stick to. So, after speaking with him, I went on with my other work telling him I'd return the next day to further discuss plans. I did return and the one occupation he said he was interested in was a plumber. His first question to me was not about what he would have to do to become a plumber, or where he could find out more information, or anything that one would expect. Instead, he asked how much does a plumber make every year? I told him. His response was very revealing. He replied with absolutely no hesitation saying' "I make more than that every month with what I do now. I don't mind spending a few months in jail when I can make the kind of loot I make now." To hope for a new life or decide what you have is what you got. In this young man's case, he had made a choice - a choice to keep doing what made him money so he could live how he wanted even though the price of his lifestyle, every few months, was to spend time behind bars. Unfortunately, there are many like minded people similar to this young man, I am not saying they are criminals - I am saying though that they spend time making money to live what they think is the good life only to find that the price they pay is continual dissatisfaction with their life, continual stress from doing something they really dislike and all for the big bucks. Is there really a big difference between the young man and those who imprison themselves five days a week doing what they dislike just so the big dollars flow in?